A fast-working, dependable and great-looking Edge LED TV with a smart TV user interface as impressive as any we've seen. It may be the watchword for all television buyers, but smart TV doesn't always find its way down to the 32-inch size. Panasonic's E6 Series is largely a big screen collection combining smart TV and Freeview HD, so to find the same suite of features on the Panasonic TX-L32E6B is a great start. The key reasons to buy this are three-fold; Viera smart TV, all-round picture prowess, and a lush design. Let's start with the latter, which certainly makes the Panasonic TX-L32E6B stand out against the competition. The design is called Super Narrow Bezel, and it's just that - a barely-there 6mm (0.2-inch) bezel surrounds the panel on three sides, with the bottom extending to about 11mm (0.4 inches). Underneath that there's a transparent plastic lip that curves in at the edges, which holds a floating white Panasonic logo at its centre. It's a great look, and the Panasonic TX-L32E6B seems ripe for mounting on a bedroom wall, too, with standard VESA holes on its rear. Our only concern is that the Panasonic TX-L32E6B's build quality isn't what it could be. It may look like it's built from metal at first glance, but it's actually plastic. Picture quality isn't exactly reference level, but the Panasonic TX-L32E6B does have all-round skills, with innate smoothness thanks to the native 100Hz LED-backlit LCD panel. We also love its provision of Cinema and True Cinema picture presets that instantly create a cinematic look that's primed for watching movies on a whim, and without the fuss of changing the picture parameters. With 32-inch TVs now costing very little, what's with the Panasonic TX-L32E6B's premium price of £549.99 (around US$845 / AU$945)? Smart TV, that's what. And though some TV buyers aren't interested - particularly those with a Sky Now TV Box or Virgin Media TiVo set-top box - Panasonic has done a pretty good job of developing its apps. The core apps everyone is after, such as BBC iPlayer, Netflix and YouTube, are all here, plus a host of others. There are other tempting morsels, too, such as a second screen app that enables you to indulge in some novel two-way exchanges of photos, music and videos between a tablet / smartphone / laptop and the Panasonic TX-L32E6B. That feature - called Swipe & Share 2.0 - also has a web browser embedded within an app that can push websites on to the Panasonic TX-L32E6B's screen. Also inside the Panasonic TX-L32E6B is a Freeview HD tuner, two 10W speakers and a trio of HDMI inputs. The Panasonic TX-L32E6B is the Japanese manufacturer's smallest smart Viera TV by a long way, though it does sell a trio of non app-packed TVs, including the Full HD panel-toting Panasonic TX-L32EM6B (£299), HD-ready Panasonic TX-L32XM6B (£399.99) and HD-ready Panasonic TX-L32B6B (£399.99). 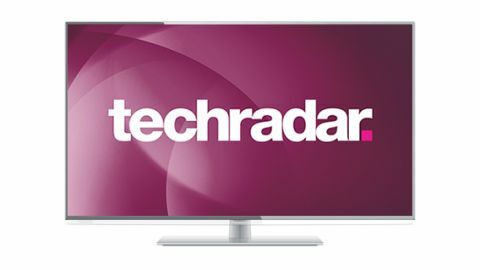 Those wanting to remain in the key E6 Series can go bigger, with Panasonic also selling the 39-inch Panasonic TX-L39E6B (£749.99), the high-ranking 42-inch Panasonic TX-L42E6B (£899.99) and 50-inch Panasonic TX-L50E6B (£1,122.99). There are also white coloured variants in the range. We genuinely like what Panasonic has done to its smart TV platform in 2013. It all centres on My Home Screen, which is pretty fluid. Various screens - TV Home Screen, Lifestyle Screen and Info Screen - can be tweaked in terms of design and app content, with shortcuts, links and live TV windows all up for grabs. Designing them isn't difficult, though we do wonder if anyone will actually create 'Dad's screen' and 'Daughter's Screen'. Is that kind of micro-customisation really needed? Probably not, but it's a very flexible system nonetheless. All screens have a a live TV thumbnail, which is crucial, as well as detailed and nuanced graphics. Apps and widgets can be added to any screen you like, but there is a dedicated page. Along the top are links to the Panasonic TX-L32E6B's widgets - Media Player, Media Server, Viera Link, Web Browser, Main Menu, TV Guide and Live TV - while a two-page grid of apps sits below that far better than the Viera Connect of old. The app page is certainly influenced by Samsung's Smart Hub. We've got few complaints about the kind of apps on here, though most are info-based rather than video hubs. The second page is pretty poor, giving icons for widgets such as World Clock, Dates, Calendar and Notes, though if you try to launch any of them you receive a curt reply that says: 'The APP is intended for Home screen usage and must be launched from it'. So customisation is obligatory? That's not very smart at all. The Freeview HD EPG is still one of Panasonic's problem areas - it's just so drab and spreadsheet-like - but at least it now has a live TV thumbnail, albeit a postage stamp-sized screen hidden away in the corner. However, it's likely you'll never use it, because My Home Screen contains a scrollable roster of TV channels on the right-hand side that is perfect for seeing what else is on. If you do need more information on schedules, there is an excellent Rovi TV Listings app available, which could easily be pinned to your Home page. Incidentally, other apps on the Panasonic TX-L32E6B include BBC News, BBC iPlayer, Eurosport Player (subscriptions needed), YouTube, BBC Sport, iConcerts, Skype, Netflix, Euronews, Dailymotion, EuroSport, CNBC Real-Time, PlayJam Games, SHOUTcast Radio, Aupeo, Chess Challenge, Rovi TV Listings, Social Networking, Facebook and Twitter. That's not a bad haul, but it's not as good as Samsung's provision of ITV Player, 4OD and Demand 5 - and where's Lovefilm? On the rear of the set are three HDMI inputs alongside an optical digital audio output, a wired Ethernet LAN port, a set of component video inputs and associated phonos, Scart, and an RF aerial plug to fuel the Freeview HD tuner. Down the side is a Common Interface slot and two USB slots, one of which can be used to hook up an HDD drive, though recordings from Freeview can't be made. Also on the side - which is nicely recessed to avoid cables poking out - is a headphones jack. Picture tech choices are limited, but oh so flexible. There is an Adaptive Backlight Control that responds to ambient light to lower the panel's brightness, as well as some excellent preset picture settings, the most important of which are Cinema and True Cinema. There's also a Custom setting that can be assigned to individual inputs for those willing to delve into the Advanced Settings menu. Inside this is a comprehensive colour management system, a 10-point gamma control and both two-point and 10-point white balance controls.